EAT.DRINK.THINK. : Dinner party, part 4: Having my cake and eating it! Dinner party, part 4: Having my cake and eating it! As I’m sure I’ve made clear, when it comes to dessert I’m a huge cake guy. Not to limit myself though, because honestly when to comes to dessert I’m a huge dessert guy. w does most of the baking in these parts, and she indulges my cake fetish quite regularly. For the perfect ending to our dinner party last week she pulled this recipe off of, of all places, the Libby’s Pumpkin website. This cake was, even through the fog of far too many bottles of wine, incredible. Topped with the maple cream cheese frosting from Leite’s Culinaria (this is frosting, btw, that will have you asking your significant other to shed their clothes so you can spread it on their bodies and lick it off. It’s sexxxy! ), it is almost not to be believed. So good, that when one of our guests asked for some to go, I almost said no, and then when I saw the next day that she had walked out and left it in our fridge I was actually giggling with glee. Not the slightest feeling of “oh, maybe I should call Kate and let her know”. Just me going “oh boy, oh boy, oh boy! !” Sorry Kate, but I dig this cake…. Out of the oven, waiting to be frosted in sin! BAKE for 35-40 minutes or until wooden pick inserted in center comes out clean. Cool in pans for 15 minutes. Remove to wire racks to cool completely. In a stand mixer beat all the ingredients on medium until fluffy. 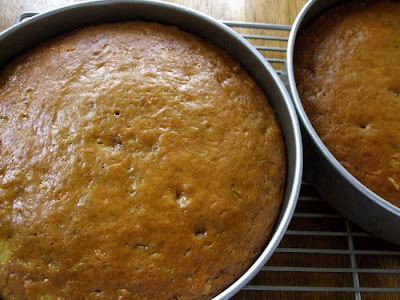 To assemble the cake, frost the top of one cake, place the other cake on top. Frost the sides and top, swirling decoratively. Refrigerate the cake for 30 minutes to set up frosting. FROST between layers, on sides and top of cake with frosting. Garnish with remaining nuts if desired. Store in refrigerator. one year ago today @ E.D.T. : watch out, they're coming for you! I love carrot cake but lately am bored with my recipe - love the idea of adding pumpkin puree...I should be able to cut back on the oil too. Maple cream cheese frosting sounds lovely with this. The pumpkin was a great addition. Added richness and a great flavor. Plus you can cut back on oil. Enjoy! I love the sound of this cake and with this frosing. It must have been absolutely delicious. Looks really pretty, too. Donna...one word: CRAZY! It is, as I said, an awesome cake, and whoever gets to lick the frosting bowl is indeed blessed!! Ok, in the method, I see to add the coconut along with the nuts? Yet.....coconut is not given in the list of ingredients??? So is coconut used? and if so, how much?